Will Maher, back in the Castleford Tigers 19-man squad. Daryl Powell has made a number of changes to his Castleford Tigers 19-man squad who will take on Hull FC at the Mend-A-Hose Jungle on Friday night. 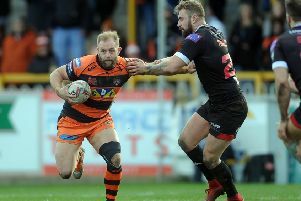 With a home semi-final already confirmed for next week, the Tigers head coach is resting several of his first teamers to ensure they are fit for the play-off game. Zak Hardaker, Oliver Holmes, Nathan Massey, Grant Millington, Adam Milner and captain Michael Shenton will all sit this one out, making way for Jy Hitchcox, Tuoyo Egodo, Andy Lynch, Ben Roberts, Will Maher and Conor Fitzsimmons. 19. Gadwin Springer, 35. Jake Trueman, 3. Jake Webster.